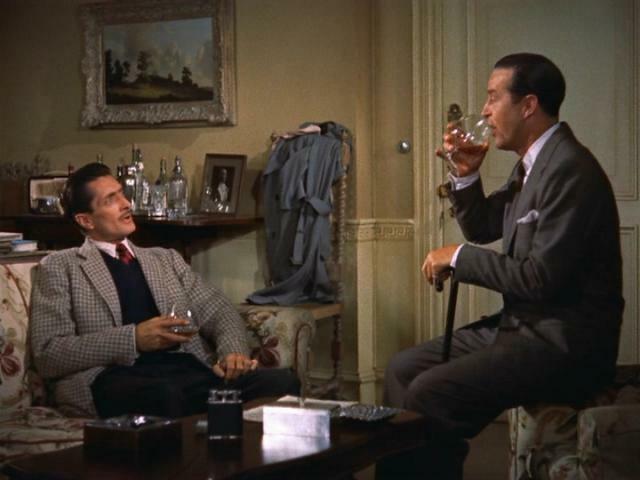 An ex-tennis pro (Ray Milland) carries out an elaborate plan to have his wealthy philandering wife (Grace Kelly) killed by a former classmate (Anthony Dawson); when Kelly manages to kill Dawson instead, Milland schemes to have Kelly indicted for murder — and it’s up to her American lover (Robert Cummings) to discover the truth in time to save her. As Peary notes, Dial M for Murder — based on a stage play by Frederick Knott — is far from “prime Alfred Hitchcock”, but it’s nonetheless a “passable suspense film” with “intricate plot twists” and a “superbly directed” (if not entirely convincing) scissors-murder scene. It’s much stagier than most of Hitchcock’s films, and relies an awful lot on dialogue to further the plot, but Knott’s story is so cleverly constructed that it’s easy to remain engaged till the end, despite the relatively static action. Milland, Kelly, and Cummings are fine in their respective leading roles; however, the most enjoyable performances are given by Anthony Dawson as Milland’s unwitting “hired hand” (as DVD Savant notes, he’s “really the victim of the piece”), and John Williams as a mustache-twirling Inspector, who has more than one card up his sleeve. P.S. 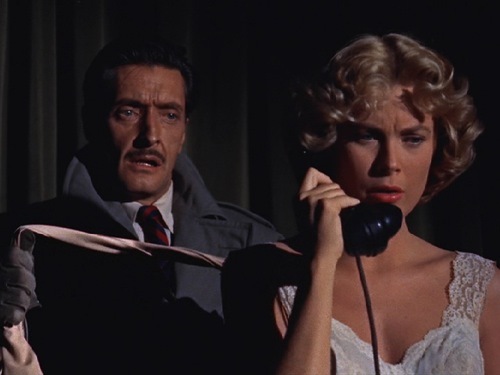 Dial M for Murder was shot in 3-D, but looks just fine in its “flat” version as well. Yes, as an enjoyable flick by a master director. As a film, this is one of my least favorites from Hitch. The middle section – everything surrounding the crime – is the only time ‘Dial…’ works…as a film. During the first third, Hitch himself seems bored, as everything seems shot unimaginatively. Granted, this long section consists of nothing but set-up…but couldn’t Hitch have done *something* to beef up the tension a little more? It’s disappointing that he doesn’t. Post-crime, there is quite a deal of talk (and almost nothing but) during the police procedural aftermath. Those who enjoy brain-teasers will certainly be wrapped up in a number of the clever, verbal twists and turns…but, once again, the film almost ceases being interesting…as a film. So, overall – too much of the film just comes off as flat. That said, generally the performances are fine, in a standard crime drama sort of way.